I apologize for the lack of posts, my girlfriend and I took a 8-day road trip through the Northeast with stops in the Adirondacks; Quebec City, Canada; Golden Pond in Maine; Cape Cod; and Mystic Seaport, CT. We had an amazing vacation and enjoyed every part of it (except the rain while we camped in Cape Cod). 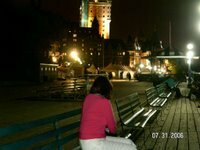 On our last evening in Quebec City we took a stroll on the boardwalk overlooking the St Lawrence River. At the end of the boardwalk I got down on one knee and proposed to my girlfriend. After dropping and recovering the ring, she said yes and we are now engaged! Besides all the obvious things about what this means for us, our relationship with each other, and our future together, this is a big change for my (and our) personal finance goals. We have already had some interesting conversations as we begin to scratch the surface on how all of these things will evolve. Stay tuned! Note: This was the best picture I had of the setting - it was perfect. We both thoroughly enjoyed Quebec City. Congrtas....If my girlfriend would get a damn job, I'd marry her too! Congratulations. Wish you for the best. Aww, amore. Congratulations. This should provide some more excellent posts on combining two incomes, two different views on personal finance, and of course just great topics as who should pay for the wedding. Congratulations! I have mixed thoughts on marriage and finances. In my case my fiance is a school teacher and doesn't love her job, but she is somewhat on the frugal side. She is much more conservative with money than I am and we sometimes don't see eye to eye on finances. It will make for interesting discussions as we begin to talk finances and the future.I don't have a sense yet of how this will affect my finances. I think there will be some benefits and some drawbacks that will end up canceling each other out when it comes to the bottom line - thats my expectation anyway. Wow!! Congratulations. What a fitting completion for a wonderful holiday! Congratulations and good luck on reducing the overheads. Congratulations!!! Fantastic news, and fantastic place to propose!! !